So let's catch up on this week's happenings over at the Court. Argument weeks are always busy, but this one was a bit less so, with only one opinion and five oral arguments instead of the more typical six. Still, with chatter about the new health care bill someday making its way to the Supreme Court, an execution stayed, and Asian carp still threatening Lake Michigan, there was plenty going on to keep things interesting. Probably most of note this week were the Court's orders, as noted by Lyle on Monday. An order of the Court can be many things: it can grant or deny cert., it can stay or deny a stay in an execution, or it can tell attorneys to do something (like file an additional brief). This week, the Court did not grant cert. in at least two cases in which some thought it might do so: it declined to review an appeals court ruling that took away the power of federal judges to stop transfers of Guantanamo detainees, and it also denied cert. in a case involving religious music in schools. In the public school case, Justice Alito dissented from the denial of cert. Why might a justice choose to write such a dissent? There are several theories. First, because it only takes four justices to grant cert. (the so-called "Rule of Four"), a justice might feel frustrated when he or she is unable to garner the necessary votes on an important question. Although the case will never be decided and the dissent will have no legal effect, the justice might write simply to express his views or to have them on the record. Second, a dissent from the denial of cert. might signal to future advocates and litigants what issues the Court considers legitimate or worthy of a cert. grant in the future. Finally, a justice might write to respond formally to the private discussion amongst the justices in their conference and to encourage further debate when a similar case makes its way to the Court. The Court also refused to grant an injunction "“ or order someone to do something – in an original action, the one involving the state of Michigan and its Asian carp problem. You may remember that I explained this case here; this plea marked the second time the state has asked the Court to order the federal government and others to try to keep the carp from migrating into Lake Michigan. But stay tuned "“ the Court has yet to rule on whether it will re-open an original lawsuit in which the carp issue could still be decided. The Court also dismissed a case that had garnered a lot of attention: KBR Technical Services v. Jones, involving the liability of military contractors for misconduct by their employees in war zones. The Court will typically dismiss a case after cert. 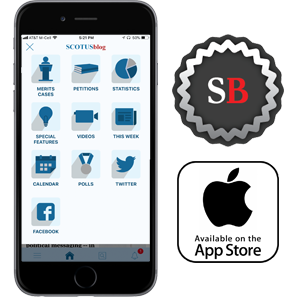 has been granted if the parties settle the case or if it determines that cert. was "improvidently granted" (hence the term "DIG," despised by all at the Court because it means that work went into a case that the Court cannot properly decide). But the Court had not yet acted on the cert. petition in this case, allowing the parties to withdraw their cert. petition. Based on a statement by the company, it appears that KBR did so because it wanted to be sure that it complied with a newly passed federal law, the Franken Amendment. Which states that Pentagon contractors may not receive federal funds if they seek to enforce arbitration of sexual assault or harassment claims against them. The dismissal leaves for another day the important question raised by the case: which claims of employee misconduct (like the sexual assault claims here) must be resolved in court rather than through arbitration if the plaintiff so desires. The Court did decide one case this week, United Student Aid Funds v. Espinosa. As Bryan Henderson discussed here, the decision, while narrow, may benefit a small number of students with educational debt. First, the Court held that a bankruptcy court must determine that undue hardship is present before it discharges student loan debt in bankruptcy. However, even if it doesn't make such a determination, it does not have to reopen its bankruptcy judgment. Furthermore, if the creditor receives notice of the proceedings, a student debtor's failure to follow bankruptcy procedural rules involving service (a formal notification) of a claim is not material. Interestingly, although many are asking whether this rule extends beyond the student loan context, the Court made clear that its ruling is limited to student loan debt. Such a limitation is an example of the narrow ruling tradition I discussed here. 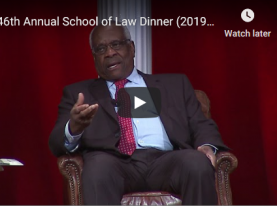 Justice Thomas authored Espinosa, raising a question from one of my students: Is this an unusual chance to hear Justice Thomas's "voice"? The student was acknowledging the fact that Justice Thomas virtually never asks a question during oral arguments (he last spoke up during argument over four years ago). But we have to keep in mind that, when a Justice writes an opinion, he or she speaks for the Court majority. In other words, every Justice has a unique writing style, but the content of the opinion reflects the opinions of others besides the authoring Justice. In one last development this week, the Court stayed the execution of a Texas inmate just hours before his sentence would have been carried out. The issue? How a state inmate must seek DNA testing of a sample that could exonerate him. The petitioner claims that he has not been able to avail himself of his constitutional rights through state proceedings. Because federal courts are split on how such claims should be litigated, the Court may grant cert. on the issue. So how does a stay work? Well, it takes the votes of five justices to stay an execution, but only four to grant cert. Because situations might arise in which four justices would like to hear a case but cannot practically do so unless an execution is stayed, a fifth justice who did not initially vote to grant the stay will usually offer a "gentleman's fifth" vote (now also known as a "courtesy fifth"). This tradition is said to have begun in the 1980s with Justice Powell, known as a gentleman in all circumstances.